Jim initially contacted me about providing him with nutrition counseling and exercise programming online as he lives in Virginia, approximately 3,000 miles away. Jim’s goal was to climb Mt. Borah, the highest peak in Idaho. He realized it was a lofty goal since he had a sedentary job, was 100 pounds overweight, hadn’t worked out in years, had diabetes, high cholesterol, low back and neck problems, and painful leg burning (a complication of diabetes called neuropathy) whenever he did any cardiovascular exercise. Jim could have accepted his current condition and lifestyle as his fate and his health would have continued to get worse possibly leading to more complications of his heart disease and diabetes. He would have progressively continued to gain weight, get weaker and lose quality of life and functionality. Instead, Jim chose to take action! 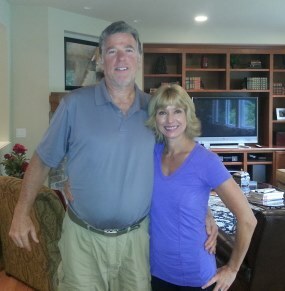 We met initially on the phone to review Jim's medical history, workout experience and recent exercise. He explained that he worked long hours, traveled frequently for work and dined out almost every lunch and dinner. Jim kept track of his food intake on an online log; we reviewed it and determined he was currently eating over 4,000 calories and 180 grams of fat per day. That is twice the calories and three times the amount of fat he should be consuming. Put together all the piece to create a workable solution. Set a realistic weight loss goal. Develop a non-gym progressive weight training and exercise plan that Jim could implement immediately. Create a meal plan for Jim to follow. 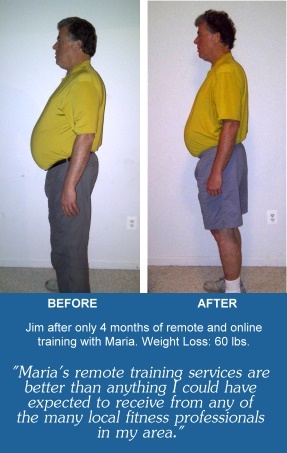 After implementing the plan, Jim lost 20 pounds his first month! His back problems were going away, the burning his legs when he walked was improving and he was able to cut his medication dose in half. He still found that he could go out to eat but understood how to order healthier items and deal with social situations. Jim and I stayed in contact via email when he needed a question answered and we scheduled weekly phone calls to review his food journal, his meal and exercise plan. We even did an occasional “form and technique” check of his exercises using Skype. I continued to educate Jim via educational emails. His progress continued. Four months after beginning the plan Jim lost 56 pounds improved his strength and cardiovascular fitness so much that he successfully summited Mt. Borah. Mt. Borah was part of a cross country drive with his family. Jim made a stop at my Sammamish workout studio to pay me a visit. Jim and I still continue to talk on a weekly basis, so I can provide accountability, answer his questions, and modify his meal plans and workouts as needed. See what Jim had to say about his results.